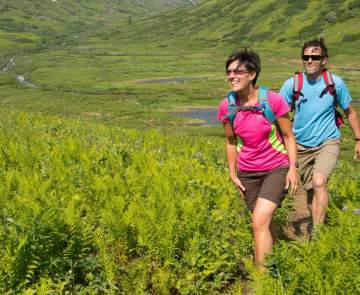 DID YOU KNOW THERE ARE MORE THAN 2,000 MILES OF TRAILS IN THE MAT-SU VALLEY? Hike, bike, ski, snowshoe or ATV and snowmobile on this vast recreational system! Below is a list of some of the more popular trail systems groups by geographic location. Refer to the map below for the general location. 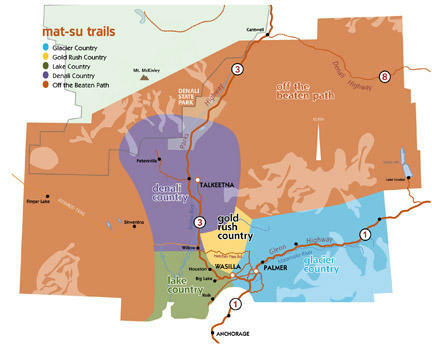 You can also download a trail map and description by clicking on the trail name. In late 2016, the Mat-Su Borough produced updated color versions of 15 trail maps. Below, they are noted as "updated." You can download and print these maps before heading out in the Mat-Su Valley on your next hiking adventure. Another great resource for local trails is a Mat-Su blog called Thrive Outside. They have hiked almost every trail included on the blog, and have provided many excellent links to maps, conditions, directions and more. The following trails are maintained by the Alaska Department of Natural Resources, Division of Parks and Outdoor Recreation.